Imagine traveling from your base camp (or shall we say home), to a given destination. What do you take with for first aid, in preparation for the unexpected? 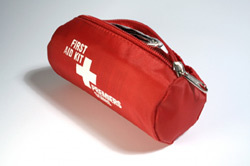 First Aid Kits.org explains the differences in first aid kits, i.e. how first aid kit contents should differ depending on the type of outing, and offering the reader a detailed list of necessities and explanation for their inclusion. Native American Medicine Men, through trial and error, built their medical kits based on information passed down from generations before, adding additional contents based on trial and error, drawing from Nature around them to provide many of the essential ingredients used in making their medicines. In turn, each culture has developed its own medical kit in much the same manner. First aid kits are exactly what the names imply, a compact container used to carry basic first aid supplies before further medical attention arrives. Over the years, this author has done numerous presentations in wilderness medicine. In every presentation, I have learned something from my audience. I will also add your tips and suggestions regarding what you should take with you, as well as any creative tips you may have regarding basic first aid treatment. We will address various first aid kits for adults. We will discuss the poor man's pack, day pack/weekend pack, and first aid kits used for excursions greater than one week. First aid kits must be tailored to where you are traveling. Climate is an important consideration; so too is what you will be doing once you arrive. Will you be out in the woods, possibly coming in contact with venomous animals/insects? As we all know, humans make numerous mistakes! These mistakes can translate into injury. With respect to first aid, this usually falls into two categories: Not knowing enough, especially how to render care, and secondly, rendering more care than necessary, or trying to be “Johnny Rescue,” the paramedic or doctor wannabe. Both of these scenarios have the potential for danger. A personal inventory of one's knowledge and psyche should be explored. Unfortunately this is difficult as many individual become defensive and become stuck in this phase. If you are camping with someone like this, and we all know a few of these individuals, exercise caution in allowing these individuals to take charge in a crisis situation. Another common mistake made by all of us is not replenishing our medical kits or checking expiration dates on medications you are taking with you.